Lower Opal Creek at higher flows. The Lower Section of the LNF from the mine down to Thors is best at higher water in my opinion but there are several hazards that develop that boaters should be aware of. First, this river has a fast runoff. If it is raining hard chances are the Little North Fork is coming up fast and you should be prepared for this. The best way to gauge what sort of day you are in for is to look at the ledge drop at the put in just above the mine. 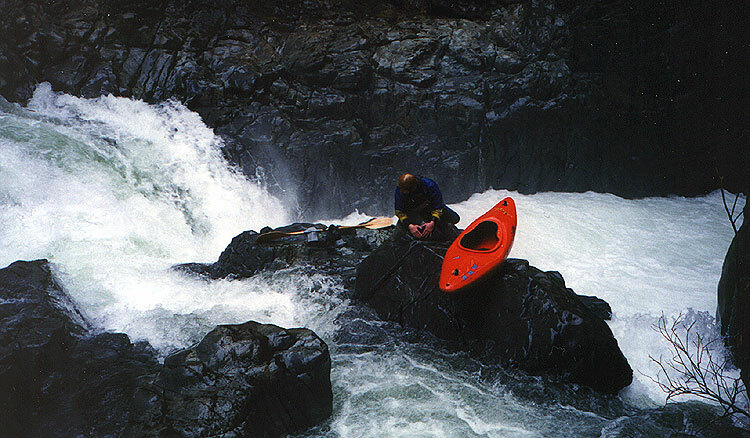 If the entire ledge is runnable you can expect to have some exciting moments downstream. If only the far river left side is runnable the river is running medium to low and is quite a bit easier. The first big change is the portage around Big Fluffy. At medium high to high flows the usual seal launch platform becomes an island, requiring a really dicey climb out over a newly formed waterfall on the right to get to the platform. This is really intimidating but doable. We have never had a problem here, but some boaters choose not to risk it and instead walk over the logs spanning the gorge below Big Fluffy. Chopper makes it to the island to seal launch at Big Fluffy. The last spot that changes dramatically when the flows go up is the final rapid, Thors Playroom. (This is also known as three pools, though whoever named it that never saw it at higher flows!) 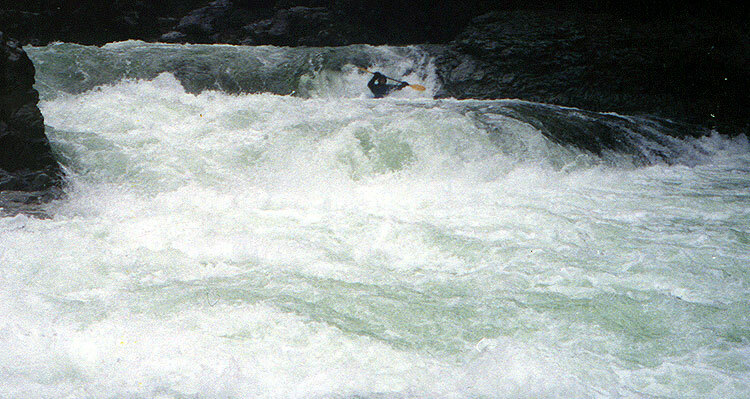 This series of rapids turns into a big water roller coaster ride, especially the last double drop above the take out. The usual line is still doable at higher flows, but on the day we were taking pictures we ran left to avoid the hole. The Author runs Thor's at a good flow. Ten minutes after the photo above was taken we watched someone swim through the river right side of this drop. This was a pretty unpleasant experience for everyone involved, so be sure to scout this one ahead of time.